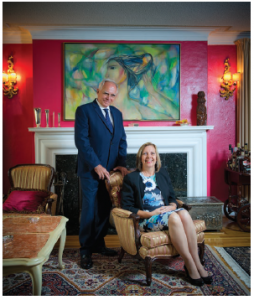 Josephina de la Caridad Vidal Ferreiro and José Anselmo López Perera have all the comforts of home in their snug residence on Acacia Avenue in Rockcliffe. 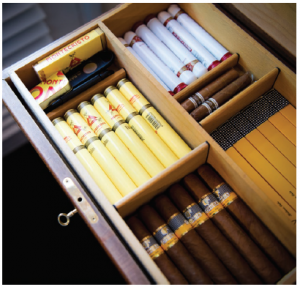 There is a vast array of fine Cuban rum and a wooden humidor full of Cuban cigars. But this unique diplomatic husband-and-wife team would be at home anywhere they land. In Ottawa, she is Cuba’s ambassador and he is the minister-counsellor, although with a twinkle in his eye, Perera insists he’s the ambassador at home. They are actually quite used to role reversal. In past public service life, he has had the leading title in postings, she the lesser. 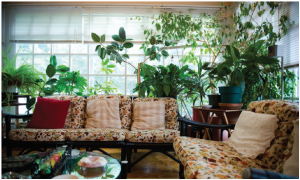 The couple arrived in March, just in time to face an ice storm, but since then, they’ve settled in nicely to their 1940s Tudor Revival-style home, which is typical of many homes in the area. 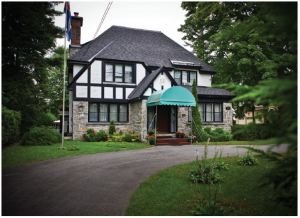 The two-storey house has leaded glass windows and belonged to an exchequer court judge named Camil Noël when Cuba bought it as its ambassador’s residence in 1970. Of moderate size, the main reception room had already been extended with the addition of two rooms; a smaller sitting room and a sunroom attached by French doors. The casually decorated sunroom is now a smoking room to which Perera retires with guests to try a variety of Cuba’s best Havanas. “We shut the doors,” his non-smoking wife points out. At the time of the extension, the ambassador of the day added to the garage to make room for two cars and extended the very small dining room forward towards the street to make some more room. Now at least 14 guests can sit down for a Cuban dinner. 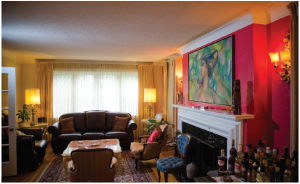 Comfortable leather furniture dots the two principal reception rooms and a bright pink wall is the focal point of the main room, where a large modern portrait hangs over the fireplace. Many examples of works by artists of the Cuban Vanguard movement of the ’20s and ’30s adorn the walls of the house. These artists broke with the European style at that time. Case in point: a portrait of a guajira, or peasant, by well-known painter Victor Manuel and a contemporary view of Havana’s cathedral. Proudly displayed is a stunning photograph of Fidel Castro taken by iconic Canadian photographer Yousuf Karsh in Havana after Castro invited him to take his portrait. 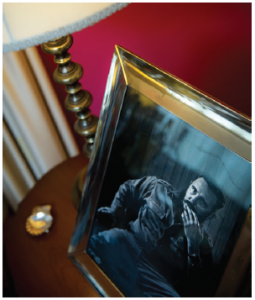 This is one of several that Karsh printed and was chosen by the ambassador at the time for the embassy. There is also a picture of the ambassador with Castro and the father and grandfather of Elian Gonzalez in Havana. In 2000, six-year-old Elian sparked a firestorm in Miami between the U.S. and Cuba after his mother and others died at sea trying to reach Florida from Cuba — he and two others survived and were rescued. At the time, Ferreiro was working at the Cuban Interest Centre in Washington and was at the centre of the negotiations for Elian’s release. She eventually flew back to Cuba with him and still keeps in touch with him and his father. There is also a smiling picture of the ambassador with Raul Castro. It’s very casual, she says, because she was at the airport saying farewell to Jimmy Carter when she bumped into him and asked for a picture. He gave her and her colleague a big hug. Voilà… a lovely shot. In the dining room, the neutral theme is delightfully brought to life by a large painting of a rooster by Mariano, a painter whose bright and lively images of roosters are well known in his island home. 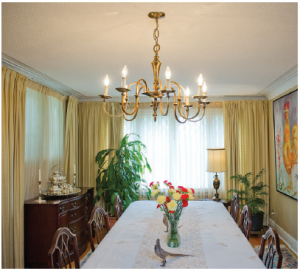 The dining room table is enhanced with gold-embossed glasses with the crest of Cuba and by cream and gold plates along with engraved silverware for formal dinners. A lovely collection of silver was provided by Cuba’s first ambassador to Canada. hundreds of years ago in Spain when a poor, hungry elderly man who couldn’t afford food for his family shredded and cooked his clothes. As he said a prayer over the boiling cloth, a miracle transformed it into a thick meat stew. Ropa vieja consists of slow-cooked, easily shredded meat with vegetables. Tamales, flans and mango ice cream are among the chef’s specialties and there are always mojitos and daiquiris spiced with Cuban rum. The house is bigger than it looks, with seven bedrooms, two of which have been converted to offices and one reserved for visiting dignitaries on official business. And there is a very large garden, where children of diplomats often come to play. With the verve and enthusiasm of these new residents on Acacia Avenue, the streets of Rockcliffe should be grooving to the pleasures of Cuban music and the spices and scents of all things deliciously tropical. Margo Roston is Diplomat’s culture editor.